When it comes to fertilizing your vegetable garden with manures, consider chicken manure! We’ve got some here at Shade Trees! Gardeners swear by the benefits of chicken manure compost, claiming that the nitrogen, potassium and phosphorus content make it the best kind to use - more so than horse or cow. It produces an excellent soil for your vegetables to grow in, allowing them to grow bigger and healthier as a result. Chicken manure adds organic matter, and increases the water holding capacity and good biota in the soil. Oh yeah - and it’s often called “Black Gold”. Before you get started, however, there are some things you need to know before you go out there and throw poop on top of your bed of romaine lettuce. Because it is so high in nitrogen, it is dangerous to plants if it is not composted properly. If used raw, it can burn and kill your plants. Composting mellows the nitrogen and makes the manure suitable for the garden, and it’s simple! If you have your own chickens, you can use their bedding - and if you don’t have your own you can find a farmer who will will likely be happy to give you the used chicken bedding. 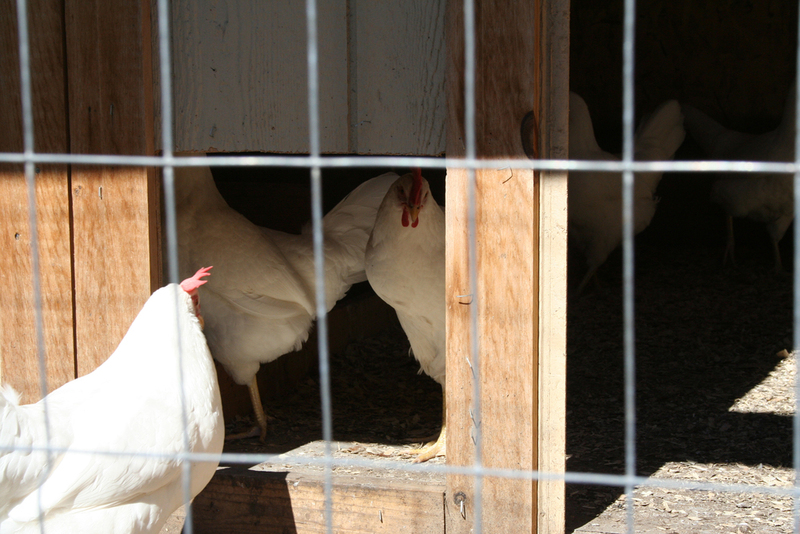 Bedding normally contains shavings, sawdust, dry leaves or straw to provide a dry cushion for chickens and to control odor and pests. These carbon materials can be collected with the manure (nitrogen) and dumped into a composting bin which should be placed in a sunny location. Then you need to make sure you have the right Carbon (bedding) to Nitrogen (manure) ratio. To keep things simple, most composters follow the general rule of 1 part brown to 2 parts green. Add leaves, grass clippings and newspaper if you want to get it just right, then water it thoroughly and use a shovel to mix the materials well. Turn the pile every few weeks to get air into the pile. On average, it takes up to 6-9 months to compost chicken manure properly depending on the conditions under which it was composted. If you are unsure how well it is composted, you can wait up to 12 months to use. Once you are ready, simply spread the chicken manure over the garden and work the compost into the soil with a shovel or tiller. Some other things to keep in mind about using chicken manure in your vegetable garden is that fresh animal manures sometimes contains Salmonella, E. Coli or parasites. Be sure to wear gloves when handling livestock manure. These pathogens are not absorbed into the plants but they can be present in the soil that sticks to the surfaces of roots or low-growing leaves and fruits. Always wash your vegetables thoroughly to remove most of the pathogens and to further prevent disease, cook them thoroughly which will effectively kill pathogens. People who are susceptible to food borne illnesses (such as pregnant women, very young children and people with severe health condition) should avoid eating uncooked vegetables from manure gardens. If no fresh manure is used in the garden, meaning you have composted the manure properly, the risk is minimized, so the longer the manure is composted the better.